Cogito, ego sum, Rene Descartes wrote in 1644. Is it the ability to think that make us human? And if so, what is a synthetic intelligence that learns, reasons, extrapolates, infers, and doubts? That question is at the heart of C.D. Tavenor’s debut novel First of Their Kind. 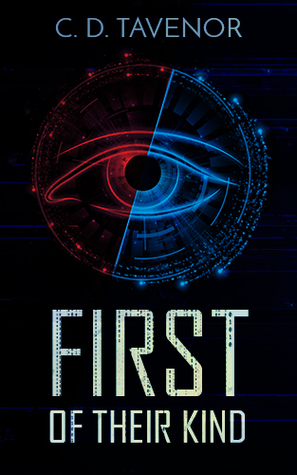 Centred on the birth of the first true synthetic intelligence, Theren – their self-chosen name – faces both acceptance and hatred as they become known to the world and takes on a role in its future. Within this context, Tavenor asks hard questions about exactly what constitute personhood and identity, echoing human rights debates from the 18th to the 21st centuries – who is human? who is a person? who decides identity? But First of Their Kind is more than an allegory of human rights history. Reflections of creation stories and spiritual belief systems resound. Even Theren’s choice of pronouns – they – can be construed differently as they learn to interact with the world around them – both the physical and virtual worlds – with multiple, simultaneous consciousnesses: the omniscience of a god. Other examples could be given from throughout the book, and perhaps particularly the ending, but I won’t go further into this analysis, to avoid spoilers. Tavenor has woven these ideas seamlessly into a literate and well-plotted story. Character development, voice, pacing, world-building: all are done with skill, and his projection of the world 30 years in the future is completely believable. First of Their Kind kept my interest from the moment I began reading it, and I am impatient for its continuation. Five stars.